It took a long time, a very long time, for the FISA-FOCA bubble to burst, and as we saw in the previous chapter, a lot of the inflating was done before either of the organisations was called FISA or FOCA. However, with Balestre and Ecclestone expelling all sorts of nasty fumes, the tension was building up quickly now. Which party would be wise enough to let off steam? And if neither of them was inclined to do so, what event or what action would set all that hot air free in an explosive way? As the sides lined up on the battlefield, swords drawn, guns loaded, the 1979 season got off with Balestre sending his cavalry for a sweeping attack across the FOCA flanks. As usual, the season had its early January start in Argentina on Buenos Aires’s No.15 track, in the middle of southern-hemisphere summer, and the heat was getting to the foot soldiers in the battle. FOCA’s vulnerable spot was McLaren driver John Watson colliding with Ferrari’s new signing Jody Scheckter on the first lap of the first GP of the season. The Ulsterman, who had been McLaren’s replacement signing after McLaren-bound Ronnie Peterson died at Monza, had been dropped by Brabham in favour of Nelson Piquet and was out to show business. 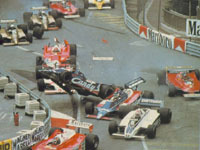 The result of the Watson-Scheckter collision, however, was that Piquet, Pironi, Merzario and team mate Tambay got involved as well. Piquet suffered foot injuries and Scheckter sprained his wrist. The rest of the cars were too badly damaged to take the restart. This sent Balestre in a frenzy and for a moment he tried all he could to have Watson penalized on the spot to prevent him from restarting the race. Watson eventually finished third in the spare McLaren but Balestre didn’t let him off the hook. Although he denied his direct involvement he announced that Watson might face a multi-race ban for his actions, or at the very least receive a hefty fine. In the end, the race stewards decided on a fine of 3,000 pounds. The affair got into a mess when Watson still hadn’t paid his fine come the Brazilian GP. Again Balestre came out threatening the Ulsterman that he risked being excluded from the event if he didn’t pay in time, and used the opportunity to slam the FOCA for disallowing their drivers to cooperate with the investigation into the Argentinian startline incident. But then Ecclestone found support from an unexpected ally: the Automovil Club de Argentina, the same ACA that only two years before had ripped its FOCA contract to pieces, now came up with the perfect solution by ‘paying’ Watson’s fine. The ‘solution’ was an embarrassment to Balestre and he sought a way to return it. He did so by coming over to England to talk to the British press. In a way that is similar to what is now known as Max Mosley’s ‘unpresidential’ behaviour when he is commenting on several figureheads of the sport – as he did with his recent remarks on JYS – Jean-Marie Balestre didn’t spare any unkind words for Ecclestone. In a well-planned PR exercise he talked openly about Ecclestone’s supposed backhandedness in the three-year deals with most organisers and accused him of forcing them to increase their reimbursement of travel expenses or else risk a no-show by the FOCA teams. It was the first of many occasions that Balestre tried to discredit Ecclestone publicly in the hope he had found Bernie’s Achilles heel. This came hot on the heels of a meeting at Maranello where Ecclestone bluntly stated that the running of the championship was a FOCA affair and that the FISA had no business in it. He even went as far as announcing a special organising committee. As far as Ecclestone was concerned, it was business as usual in his dealings with the governing body. In the past, the CSI had shown to be too weak to oppose FOCA’s dealings, and why should it be any different now? They had broken the organisers’ will – twice – and caused several CSI members to leave the field, disheartened by the FOCA strangehold. But it was different with Balestre. If FOCA wanted to play dirty – which had been their usual game all throughout the seventies – he would re-invent dirt. So Balestre started off with a few sabotage techniques of his own. This entailed, for instance, that the FISA use its power as the world’s event-sanctioning body to clamp down on FOCA-allied tracks such as Chris Pook’s Long Beach. He first did this by disallowing Pook to reschedule his race by a week, which the American organiser had planned to do to cater for the television companies. Then Balestre further frustated the Long Beach efforts by sending FISA’s track inspectors to the South California street track. There, they criticised the concrete walls lining the track, leading to Balestre threatening to cancel the 1980 race if Pook didn’t heed to the FISA’s findings – even though the drivers themselves preferred the concrete blocks over the use of Armco. All through summer Balestre continued to work on the constructors’ nerves, issuing one silly decree after another, including one that disallowed them to use commercial names for their teams in formal communiqués. Most of this went under the radar, as the 1979 season seemed to roll towards a quiet ending – at least as the unwitting casual onlooker was concerned. Concurrently, Balestre introduced a rivaling structure of F1 commissions that would be heavily FISA-biased. One of them was the F1 Technical Commission, and its proposals would remain anything but under the radar – it virtually dropped a bomb on the constructors. The Commission had been working away at new-for-1981 regulations that would increase the weight limit from 575 to 625kgs and, to make them tilt even more towards the manufacturers’ advantage, sliding skirts would be banned as well. To complement these, Balestre also introduced a fine scheme for drivers not showing up at pre-race briefings – 2,000 dollar for a first offense, 5,000 in case of a repeat. Although this seemed harmless at the time, it would later become the drop to tip the bucket over. In February 1980, Balestre formally announced the full 1981 rules package. It included the ban on skirts, the increased weight limit and the compulsory presence at a 45-minute drivers briefing, but it also included safety improvements to the cars’ frontal structure to protect the drivers’ legs, addititional cockpit-side protection and rear-wing changes. Driver changes had to be submitted four weeks in advance, unless it was a case of force majeure. In one sweeping stroke of a brush it also did away with the possibility of diesel and rotary engines, while tyre widths were restricted in 1982. A fuel-flow formula would be introduced the following year, with four-wheel drive and six-wheelers also banned as of 1983. The latter proposal would be reconfirmed in the summer of 1982, instantly making Williams’s double rear-axle sixwheeler illegal. So in the eyes of the FOCA teams, here was a rules package that was intentionally created to favour the manufacturers. The previous season had seen the first victory of a turbo car, when Jabouille won his and Renault’s home GP with team mate Arnoux third, and the turbo’s overwhelming power would easily overcome the increased weight. And with their main weapon – ground effects – threatened to be taken away from them, the non-manufacturer constructors would be looking at instant incompetitiveness. In 1980, Ferrari and Alfa would still be hurt by their ground-effects-destroying flat-twelves but they had the clout to invest in the development of a turbo engine. Where would the FOCA teams get such a engine? The FOCA’s defense seemed logical if not a bit holier-than-thou: why hadn’t the FISA consult the teams first? Surely, constructive cooperation with the FOCA would have led to regulation proposals that were in the interests of all concerned, wouldn’t it? And why wasn’t the customary two-year notice applied? Anyone could see that this would lead to enormous costs for the teams, couldn’t they? Of course, the governing body played its joker in the pack – safety. It cited the GPDA’s support of the new regulations, or GPDA’s president (and Ferrari driver) Jody Scheckter’s to be precise. How could anyone argue against that? Incidentally, the role of the GPDA would prelude a widening gap between former allies or, as others came to interpret it, was a sign of the ever-decreasing power of the drivers. In fact, Scheckter’s support led many FOCA-aligned drivers to leave the GPDA, Alan Jones and Nelson Piquet among them. Furthermore, Balestre didn’t shy away from using emotional arguments when he named Clay Regazzoni’s unfortunate accident at Long Beach, which left the popular Swiss paralysed from the waist down, as caused by those wretched ground effects. It was a classic divide-and-conquer power game by Balestre, who had now gained full backing from Enzo Ferrari, the Old Man going on to say that skirts had been illegal all along and that it had only been the ‘whimps’ at the old CSI who had neglected to stamp them out when they first appeared on the Lotus 78. "…the FISA exerts full control over the World Championships belong to it and which, at the present moment, are the subject of a takeover by certain private associations foreign to the FIA. "No constructor or association of constructors may organize or be associated with a national sporting authority (or club affiliated to that ASN) for the organization of a Grand Prix. "No competitor or constructor entered for a World Championship event may be organizer of this same event." This shot across the bow of the FOCA would play an important part in the eventual resolution of the conflict. It allowed the FISA to create a new FIA F1 World Championship, with the FIA effectively acting as its overall organiser. When the conference agreed – although certainly not with a unanimous vote – they had given Balestre a blank cheque to reform the World Championship, and he immediately began filling in the numbers at the next GP at Zolder. From the Belgian GP on, there would be a designated FIA starter – which would be FISA delegate Derek Ongaro – while qualifying tyres were banned with immediate effect. And then there was the peculiar expulsion of the South African GP off the 1981 calendar, simply because Balestre had been forced off the podium of the 1980 edition. As a matter of fact, it had been the result of a prank by Max Mosley who had instructed the track’s security chief to keep him from entering the crowded stage. But now the joke was on Mosley and the FOCA, as the proud Balestre insisted on pointing the organisers to their “responsibilities”. In the end though, the ban wasn’t upheld and there were other reasons why the 1981 South African GP didn’t become part of the 1981 championship. In Rio, the FOCA had reacted with silence but in Belgium they acted with typical FOCA clever stuff, as they had discovered that the 45-minute driver briefing had been left out of the race’s supplementary rule book. This conveniently allowed the FOCA teams to instruct their drivers to stay away and thus ignore one of Balestre’s personal new toys. The next event at Monaco was a strange interlude in that the FISA and the FOCA found themselves on the same side against their drivers on ironically the 20th anniversary of the GPDA. As in 1972, even though no-one even mentioned those proceedings, the number of starters was in contention, and the result was that both the FISA and the FOCA got their way, with 20 cars allowed into the race but all 27 entries taking part in official practice instead of some of them being involved in the usual elimination round called prequalifying. Again, several drivers stayed away from the drivers briefings, the number of unpaid fines now going out of control. Meanwhile, the FOCA had published their own rules package as a counter proposal to FISA’s 1981 regulations. The teams had mulled over quite some detail, and their two-stage plan for 1981 and ’82 was a thorough exercise. But they found a brick wall at the Place de la Concorde. Balestre’s tactics simply echoed that of FOCA’s in the past when its adversaries tried to negotiate an unfair deal. He ignored them. By the time of the FOCA-organised Spanish GP the argument boiled over. Now it wasn’t just John Watson who was threatened to pay his fine or else, it was almost the whole of the FOCA driver phalanx. This time, the looming penalty was the loss of their licenses. Some drivers argued that they had already paid or that their sponsors had done so. The confusion that followed led to some frantic discussion in the run-up to the Spanish GP. But little did the Real Automobil Club de España (RACE), Jarama’s organising club, know that their race was to be the scene of the FISA-FOCA war’s first genuine battle. Because that had become obvious to the insiders now – it was war. Initially there was some bickering over the question whether the fines had been approved at the Rio spring meeting – which they hadn’t – but Balestre simply stated that his word was law, repeating that the Plenary Conference hadn’t had any power to veto all of his ‘proposals’. When it was obvious that the drivers weren’t about to pay, Balestre issued an order to the national motorsport authorities to revoke the respective drivers’ competition licenses. The FFSA, being Balestre’s own domain, did not have any qualms in doing so, which was quite disconcerting to the likes of Prost, Jarier, Pironi and Laffite, all of whom were present neither at Zolder nor Monaco. The argument wasn’t getting any closer to compromise when Jody Scheckter, on behalf of a GPDA which now as a united front seemed dead and buried, stated that the delay in payment was nothing short of a provocation – to which it was pointed out that Scheckter spoke on behalf of Ferrari and the FISA rather than the drivers in the dock. And so on the Thursday before first official practice, Ecclestone reconvened the constructors as they arrived in the paddock and they quickly agreed on an ultimatum: either the FISA give back the licenses or the FOCA teams won’t race. In a sense Scheckter was right: the FOCA had been looking for confrontation and now they got it. Balestre, ever since Rio stuck in his trenches, refused to give in. This became even more obvious when RACE offered to pay all the bills, no doubt concerned about what all this might do to their event. With no intention of accepting the offer, Balestre stated that every driver was responsible for paying his own fine. In a press conference on Thursday evening he made it clear that non-payment would lead to the exclusion of the driver from the race. The questions from the audience forced him into all sorts of excuses – why were Andretti and Piquet allowed to race in other FIA-sanctioned races if they still hadn’t paid, and why, pray tell, weren’t the drivers fined at Zolder prevented from racing at Monaco? With such a threat looming over the Spanish GP, now even the King of Spain got involved and he ordered the organisers to have the race go ahead, whatever may be. As it happened, Juan Carlos’s cousin Fernando Falco, the Marquis de Cubas, was the RACE president, and by his request the king went over the heads of the Federación Española de Automovilismo (FEA), which was the national motorsport federation and the official FIA representative in Spain. This in turn sparked an internal conflict similar to the ACF-FFSA tussle in the late sixties, as the RACE announced that it would reassume the sporting powers that the FIA had delegated to the FEA – which had only just happened in October 1979. Peculiarly, this one-sided move only needed a letter informing the FIA of such a hand-over, which the RACE promply arranged. Unsurprisingly the FEA would have none of it, since the Spanish GP now ran the risk of being run outside of the FISA authority. But since the RACE was the race organiser, it could do what it wanted. Of course, with the race not being a FISA-sanctioned event the drivers involved had no need for a FISA licence – which was rather practical with only days to go before the race. So, with pressure coming from the highest authority in Spain, and the Marquis de Cubas having been the man with the difficult questions to Balestre during Thursday’s press conference, the RACE decided to side with the FOCA, with which they had signed a contract after all. If they wanted to so, then fine, said Balestre, but in that case the Spanish GP would be a pirate race, ineligible for World Championship points. Meanwhile, as the FOCA teams still adhered to their ‘boycott’, first official practice went underway at ten, with only Ferrari, Renault, Alfa Romeo and local hero Emilio de Villota taking to the track, even though the FOCA had decided to postpone first practice to 10.30 am. Although Ferrari wasn’t a FOCA member it made use of its travel arrangements, as did Renault, while newcomer Alfa Romeo was only allowed to join the FOCA a year after entering the sport, as per the usual FOCA rules. It did, incidentally, reject an offer to join early, and now the three decided to put their lot with the FISA. Of course, this had been the de facto case all along, as the only drivers not being held ransom for failing to attend the drivers’ briefing – because they had been at all of them – were Scheckter, Villeneuve, Jabouille, Arnoux, Depailler and Giacomelli, the six manufacturer-employed drivers in the field. Balestre wasn’t even present at the track, since de Cubas had told him that he wouldn’t be allowed in. De Cubas was able to stick to his guns since the RACE was the owner of the Jarama circuit. This came in rather handy when his organisation decided to red-flag the ‘FISA session’ after half an hour, after which the entire FISA entourage was asked to leave the premises while being held at gunpoint by the Guardia Civil… Later that day, the Ferrari and Renault teams held a press conference in which they stated that they had no choice but to withdraw from the race since they represented major manufacturers who couldn’t be associated with taking part in a rebel event. Alfa Romeo followed suit, and the three packed up and left on Saturday, in the wake of the FISA officials that were already gone. Only Osella stayed behind after changing their entry form to keep one foot apiece in either camp, while another team hesitating whether or not to break ranks was Ligier, which was about to sign a major deal with manufacturer Talbot. Unsurprisingly, Balestre used all his combined powers of persuasion to tempt Guy Ligier across. He would eventually succeed. Now the major suppliers and sponsors began to worry, and on the instigation of Goodyear and Philip Morris an early-June meeting was held in Lausanne, at the site of Philip Morris’s European headquarters. Tellingly, Balestre did not go himself but sent his Secretary General, Yvon Leon. Ecclestone and Mosley were present on behalf of the FOCA while the FISA was represented by ACCUS chairman Tom Binford, New Zealand’s Ron Frost and Joachim Springer of the AvD. The result was startling. In no time an eleven-point agreement was hammered out to restore peace and unity in the sport. It entailed a two-year transition period and a slight revision of the ban on skirts. Proud with the results, Mosley telexed the agreement to all FISA delegates all over the world to force them into some sort of fait accompli, but his enthousiasm backfired when it was leaked to the press. Balestre was furious. He immediately accused Mosley of being at the source of the leak and told the world that everyone was supposed to have had a week’s time to mull over the meaning of the agreement – which, to Balestre at least, had been preliminary anyway, since he didn’t like its contents at all. And how could there be a transition period if the new rules had been ratified by the FISA Executive Committee? Mosley denied that last ‘fact’ since the FOCA had objected to them while they were still part of the committee. At the same time Balestre revealed that the week after the Lausanne meeting he had had a secret meeting with the leading FISA members and that apart from the RAC and the Brazilian federation everyone had signed to host a round of the 1981 FIA World Championship, while the ACCUS was still in doubt whom to support. The organisers of the French, German, Dutch, Italian and Austrian GPs even declared that they were willing to stage their race without the FOCA teams being present, instead filling up the field with F2 cars. This meant that it would be impossible for the FOCA to stage a rivaling championship, if they ever intended to do so. It was almost begging the question. Balestre’s position looked strong. He had a minimum of twelve GPs, enough for a valid World Championship. But on second thought, things weren’t all rosy. As he had learned from the Spanish GP debacle, the approval of the national motorsport federation wasn’t necessary to stage a race, while Ecclestone didn’t hesitate to point to the contracts the FOCA had with most of the organisers now aligning themselves with the FISA and threatened them with the legal consequences. At the same time, RAC’s Clive Bossom cried wolf with Metternich, stating that Balestre not accepting the Lausanne agreement would seriously damage the future of international motorsports. Both sides realised that they had to talk. Again. Meanwhile, the weekend of the French GP was coming ever closer, and Balestre was adamant that ‘his’ event would not be marred by conflict. And so he agreed to meet with the FOCA and the manufacturers after the race, while demanding that Ecclestone come back on his renewed boycott threats. The FOCA boss did so, and after a surprisingly incident-free French GP, an illustrious group gathered at the Paul Ricard circuit. Ecclestone and Mosley were joined by Colin Chapman while Carlo Chiti, Marco Piccinini, Gérard Larrousse and Gérard Ducarouge were present on behalf of Alfa, Ferrari, Renault and Ligier. The FISA was out in numbers: Balestre was supported by Huschke von Hanstein, Paul Frère and journalist Gérard ‘Jabby’ Crombac, amongst others. Most of them had already met at Heathrow prior to the race and thrashed out a package which included a five-year postponement of the ban on skirts, countered by the introduction of less efficient tyres, and a bigger voice for the constructors in matters such as the fuel-flow formula, but also a bigger say in the FISA F1 Commission. Finally, they asked for more rule stability. To Ecclestone’s surprise, Balestre seemed to take his take-it-or-leave-it offer rather well. The FOCA wanted the package to come into effect immediately but Balestre made a proviso before signing off the agreement: some points had to be voted through by the Plenary Conference at the FIA autumn meeting in October. It was nothing to do with him, he pleaded, that was just how things worked. By the next race in Britain, however, this second chance for peace was out of the window as well. There, the FISA Technical Commission met with the tyre companies to deal with the issue of less efficient tyres. It’s safe to say that Goodyear and Michelin couldn’t agree on what the FISA had come up with. While Goodyear at least wanted to negotiate, the French company stuck to its guns. This came as a shock to the FOCA teams, as they were under the impression that the FISA had used the tyres as a bargaining tool after having consulted both tyre companies! Now Balestre was able to use the companies’ difference of opinion to tell the FOCA that the entire Paul Ricard agreement was off. We were back at square one. This was exacerbated by the FISA Executive Committee doing all sorts of announcements that rocked FOCA’s boat. The Spanish GP was confirmed as a pirate race, and so Alan Jones permanently lost his nine points won at Jarama. This cut his championship lead to Nelson Piquet to just six points. To add insult to injury, the two championship rivals were among the group of drivers fined 3,000 dollars for taking part in the race. The Executive Committee also put the US GP in doubt by heavily criticising the Watkins Glen track’s safety and security measures. Meanwhile, Goodyear launched a scything attack on Michelin for obstructing the tyre talks and thus the chance to create a way out of this mess. The Akron company would announce its withdrawal from F1 on December 4, having endlessly pleaded for a sensible solution. Now relations – or what was left of them – began to deteriorate badly. While the FOCA kept saying that they tried at least six times to meet with the FISA to reach some sort of compromise, Balestre felt he was on the winning side and kept pounding out new rounds of ammo on his shell-shocked enemies. In August, the FISA announced that it would take back responsibilities for distributing starting and prize money, promising to blow away the clouds covering the current financial system. It also stated that it was striving towards new five-year deals with the race organisers which, as he subtlely pointed out, would not contain the extravant price increases that the FOCA had been laying on the clubs time and again. He also gained the full support of Ferrari, Renault, Alfa Romeo and, finally, Ligier, now in the hands of manufacturer Talbot, during a secret meeting at his home in Saint-Cloud. And in a similar blow to the teams that Max Mosley managed to pull off in 2006 when he set a deadline for entering the 2008 World Championship, Balestre announced a December 1 cut-off date for teams wanting to compete in the 1981 championship. Of course, the teams agreeing to enter would have to adhere to the 1981 rules package that was proposed at Rio in April and would be confirmed at the governing body’s October 8 meeting in Paris – three days after the 1980 season had run to an end. Balestre’s ultimatum was the last straw for the FOCA teams, especially now that it had become clear that he was after their money as well. Making the strongest noises again was Frank Williams, who all year had been telling everyone that he didn’t want to be ruled by a bunch of bureaucrats without any trace of Castrol R running through their veins – precisely the issue that only just recently caused the Indycar teams to form CART and grab the championship from under the nose of its sanctioning body USAC. All through 1980 the American events served as some sort of inspiration. But while until now some of the teams were only loosely allied to FOCA’s cause, Balestre’s announcing his plans to redistribute starting and prize monies quickly made them rally together, as other teams now firmly joined FOCA’s original four teams. Despite the Frenchman’s earlier warning that there weren’t enough organisers to go around for two championships the FOCA decided it had enough. Ahead of the Plenary Conference Bernie Ecclestone was quoted in an American newspaper as fully willing to organise a rival championship if the conference decided to reject FOCA’s counter proposals. It did. And not only that, it upheld the original 1981 rules package and decided on the formation of a new championship, the FIA F1 World Championship. This wasn’t just a provocation, it was Balestre’s political master stroke. Ecclestone and Mosley might not have realised it at the time, but the structure of the new-style championship would greatly benefit them later. As opposed to individual events with their own supplementary regulations making up a championship, as it had always been, the new championship would consist of at least 8 rounds – with a maximum of 16 – in which the teams wishing to enter the championship would be obliged to take part, based on a standard set of regulations for every organiser hosting a World Championship event. This would effectively turn the FIA into the full Championship’s organiser, with national sporting authorities, organisers and circuits all adhering to the same FIA regulations. Furthermore, teams and drivers had to be licensed to take part in the championship – for drivers, a ‘superlicense’ was created for this cause. All the teams signing up would have to sign contracts that would bind them to FISA’s standard financial regulations, which included a 30,000 dollar bond for new teams and a 20,000 dollar fine per car per event for teams failing to participate in a World Championship race. The points system would stay the same, as would the maximum length and duration of a Grand Prix (resp. 320kms or 2 hours). No points could be scored by a ‘third car’. The conference also set a period of two weeks – between November 1 and 15 – for constructors indicating their intention to enter the championship. The FISA would announce an entry list one week later. To make his intentions clear, Balestre warned everyone not to entertain thoughts of a rival championship or risk losing their licenses – not just the teams, but every organiser, driver and even national motorsport federation involved as well. That was the second time the FISA taunted the FOCA not to start an break-away series before the constructors actually found time to seriously consider it. But now, that’s precisely what they did. At first, they seemed numbed by the bomb Balestre had dropped on them but a week later, at a sponsor meeting in Milan, it transpired that they had their back-up plan ready and waiting. It wasn’t just the 14-race FIA F1 World Championship calendar that was presented to the sponsors, there was a 15-race FOCA calendar as well! It included new events at Las Vegas and the much-vaunted street race in New York but what shocked the sponsors most was that there were 11 date clashes, of which no less than eight races in fact appeared on both calendars. Something wasn’t going to fit here, or some people would have to choose sides very quickly. As could be expected, the sponsors were divided across the same lines as the teams they supported. Gitanes and Elf were in the FISA camp, Parmalat, Leyland and Candy in the FOCA camp, while Marlboro tried to remain neutral as it supported both McLaren and Alfa Romeo. Lotus sponsor Essex surprisingly sided with the FISA. They all agreed on one thing, however. If this feud wasn’t resolved soon, they would be seriously looking into other ways of spending their marketing budgets. Soon the word spread to the South African, Belgian, French, Spanish, German, Austrian and Dutch motorsport federations that their races were appearing on a FOCA calendar, and they spared no time in announcing that they knew nothing about such a calendar and even less about their events being showcased on it. It didn’t deter the FOCA. They pointed out these all these federations didn’t actually own a circuit and that the association had deals in place with the clubs that owned the tracks. The situation was mirroring that of the Spanish GP: the FEA was Spain’s national sporting authority but the RACE was in charge at Jarama. Late October, FOCA’s cat was finally let out of the bag. It announced that it would split from the FISA-sanctioned championship to create its own World Federation of Motor Sport (WFMS). This body would organise the World Professional Drivers Championship. The second word – Professional – said it all. Ecclestone vehemently criticised the FISA boffins as ‘armbands’ who flocked to the glamourous events in droves, doing nothing but drink champagne, as they wasted everybody’s time and money while thinking that they owned the sport. The WPDC on the other hand would be run by people with all the professional, commercial and sporting experience needed to wisely deal with the millions of dollars poured into the sport each year. The WFMS calendar differed in detail from the FOCA calendar issued two weeks before, but it still included several date clashes and claims on the same event that the FISA had on its calendar. Its rule book was a carbon copy of the FOCA package rejected by the FIA Plenary Conference. It retained the sliding skirts but with a reduced plane area. It contained a fuel-flow formula of 50 cc per second, restricted tyre sizes with a thread pattern, a ban of refuelling, and minimum weight of 575kgs, the same as in 1980. Moreover, a driver safety cell would be introduced for 1982 and rules were to remain stable for at least three years. The race length and duration would be the same as in the FISA regulations, just as the points system, although all scores would count. Balestre didn’t just respond with one of his outbursts but immediately went on the counter attack. On the advice of Enzo Ferrari he offered the organisers who were on both calendars the FOCA package, with the only difference being that the FISA would hand out the prize money to each individual team instead of the organisers handing over their purse to the FOCA. This was a clever move, as in financial terms there was almost nothing in between the FISA and FOCA packages, while it would certainly ease the doubters towards the FISA camp. To ‘help’ them decide the FISA announced that every circuit hosting a WFMS round would have its international license revoked. The FOCA replied that this would only harm half of FISA’s calendar as well, and that there was no inherent authority in the collection of private clubs constituting the FIA. Ecclestone and Mosley also came up with an argument that they often re-used in the nineties and until only recently – that the FIA was wrong to put its eggs in the manufacturers’ basket, as they weren’t in it for the sport and would withdraw if they saw no commercial benefit to participating in Grand Prix racing. Of course, that would be after their will to win had allowed costs to spiral up to astronomical figures, making it impossible for any independent team to continue bolstering the grids. Everyone who witnessed the downfall of FIA’s ITC championship and the first incarnation of the FIA GT championship would later understand what this point was about. With several circuit deals in place and the vast majority of the grid behind them, the FOCA certainly held a tactical advantage. The FISA did receive three-car entries by Ferrari, Renault and Alfa Romeo while there was rumour of Talbot-Matra doing the same, but the FOCA had at least seven teams and, so it thought, a legal tightlock on at least ten events. But then it found that the organisers weren’t as brave as it had hoped or, in respect to the contracts they held with the FOCA, braver than they had feared. Several circuits which were on both calendars, including Spa and Imola, issued denials of any involvement with the WFMS. And then even FOCA’s staunchest supporter, the RAC MSA, announced that its British GP would be part of the FIA F1 World Championship. It was obvious that the FOCA hadn’t looked beyond the economics of running an annual Grand Prix. For most circuits on the calendar the Grand Prix was merely a showpiece but the bread and butter came from all the national and international events they hosted. There was a snowball’s chance in hell that they would risk losing all that. FOCA sensed that a retreat was now the best tactical move, and they issued a compromise statement that offered (or asked) that all legal activity be ceased in return for majority decisions in a new F1 Commission also including non-voting members, a postponement of the ban on sliding skirts, introduction of the smaller-width tyres and now a two-year rule stability. Despite sponsors and suppliers calling on either side to stop this before the war ended in Phyrric victory, with the sport its biggest casualty, Balestre smelled that he was close to a win and said non. At the end of a fraught November month, FOCA announced that the WFMS was off. The two rival championships did at least happen in someone’s imagination. In 1982, Jean Graton, the creator of comic-book hero Michel Vaillant, published his Rififi en F1 (which also appeared in Dutch as F1 in oproer) in which Graton dwelled on the possibility of separate 1981 FISA and FOCA championships. The comic book very much brushed with reality, as FOCA-aligned tracks such as Kyalami, Long Beach and Silverstone indeed appear on the FOCA calendar while Argentina, Belgium and Monaco side with the FISA. It also presents three-car teams as the way to fill up the grids: on the back of the withdrawal of Vaillante’s F1 team Michel Vaillant signs to drive the No.17 Renault as team mate to Prost and Arnoux while his rival and former team mate Steve Warson is seen in a No.10 Lotus, comfortably outshining team mates De Angelis and Mansell and, unbelievably, racing Jones, Reutemann and Piquet for overall glory in the FOCA championship. French-born Brussels resident Graton seemed ostensibly on FISA’s side as he allowed the FOCA championship to run amok when the unnamed young third Brabham driver in the No.15 BT49C gets seriously hurt at Silverstone. The sliding skirts get the blame. Meanwhile, Jean-Marie Balestre is depicted in increasingly imperious poses while Bernie Ecclestone turns into an irate cartoon figure displeased with the fact that he isn’t getting his way. Another true-life character, journalist and FISA advisor ’Jabby’ Crombac, is the wise man very close to the Vaillants. The story gets its highly improbable ending in a reconciliatory ’Super Grand Prix’ at Spa, organised by Jacky Ickx and finishing in a dead heat between Vaillant’s Renault and Warson’s Lotus. In real life, it wasn’t to be, and fortunately so. But at this junction in time nothing else seemed certain either. Although the FOCA had cancelled its WFMS plans, it also stated that it would stop taking care of travel arrangements on behalf of Renault, Ferrari, Alfa Romeo, Talbot-Ligier, Osella and not take on new kids on the block Toleman. FISA answered by postponing its December 1 entry deadline to allow any FOCA dissenters in while cancelling the Argentine GP, set for late January, and moving back the South African GP, set for early February, to April 11. It speaks for itself that this came as a great surprise to both organisers, especially when the Argentinian hosts learned that their permit had been revoked because of safety concerns. Meanwhile, the South African GP had already signed up an event sponsor in Nashua and had produced posters for the February date. They also claimed that an April race on the Southern hemisphere was asking for meteorogical trouble as this would be a late autumn date. A more pregnant detail was that Kyalami Enterprises, the company in charge of the track, had signed a FOCA contract for the teams to appear in February. As a result, Argentina was handed the April 12 date – for the time being. By now the situation was clear as mud.